Alpine squalls or urban downpours, the StormLine Stretch Rain Shell can handle it all. 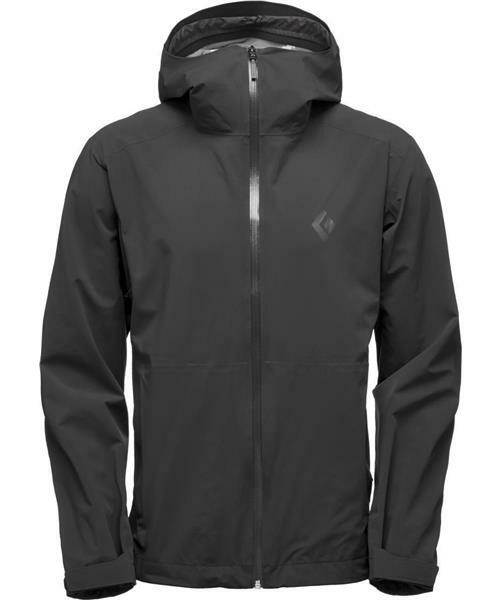 Featuring Black Diamond's BD.dry™ waterproof/breathable/windproof solution, which is engineered to shield you from whatever the weather holds, the StormLine is a fully featured rain shell. With DWR sealed pit zip vents, two zippered hand pockets and a waterproof center front zipper, the StormLine comes prepared for the wettest conditions but quickly adapts for moderate weather. The StormLine’s underarm gussets and ultra-stretchy fabric add mobility and durability, while the climbing-helmet-compatible hood makes it perfect for on-route escapades when inclement weather rolls in. The StormLine also has an adjustable hem and cuffs for dialing in the fit, and when the sun comes out, the shell stows into the right-hand pocket and clips to a harness or bag with a carabiner clip loop.